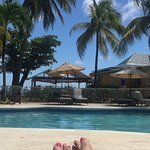 Bequia Beach Hotel and Bequia itself is time well spent. I am still kicking myself that I did not stay longer. It was paradise found and now I long for more. The owner Bengt, who frequents the hotel, mingles and connects with guests and his friendly and professional staff make this a phenomenal experience. The attention to detail is seen in the stylish, eclectic-Caribbean décor, beautifully manicured property and right down to the fact that every sheet and napkin is hand ironed on the property. Shay who works on the beach/water sport recreation was all smiles, helpful and did not judge my stand up paddles board skills (or lack of), Donna from housekeeping found sunscreen and après lotion for me when I ran out! And the front desk staff is the sweetest and so helpful. I enjoyed the sunset cruise on the hotel owned superyacht “Star of the Sea” and the bartender Peter (who also tends bar at the hotel), immediately remembered my friends and my drink. It was the dot on the ‘i’ in impeccable service. 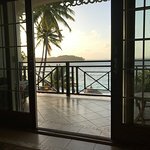 The hotel itself, the staff and small beautiful, but vibrant island make this a location that I plan to return to with friends. Sooner than later. 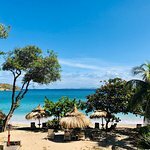 I feel I found a gem in the Caribbean that no one knows about, which is partly why I nearly hesitate to share and write a review. However, the undeniably above and beyond service I got to...Bequia Beach Hotel and Bequia itself is time well spent. I am still kicking myself that I did not stay longer. It was paradise found and now I long for more. The owner Bengt, who frequents the hotel, mingles and connects with guests and his friendly and professional staff make this a phenomenal experience. The attention to detail is seen in the stylish, eclectic-Caribbean décor, beautifully manicured property and right down to the fact that every sheet and napkin is hand ironed on the property. Shay who works on the beach/water sport recreation was all smiles, helpful and did not judge my stand up paddles board skills (or lack of), Donna from housekeeping found sunscreen and après lotion for me when I ran out! And the front desk staff is the sweetest and so helpful. I enjoyed the sunset cruise on the hotel owned superyacht “Star of the Sea” and the bartender Peter (who also tends bar at the hotel), immediately remembered my friends and my drink. It was the dot on the ‘i’ in impeccable service. The hotel itself, the staff and small beautiful, but vibrant island make this a location that I plan to return to with friends. Sooner than later. 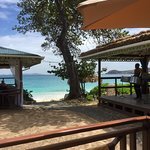 I feel I found a gem in the Caribbean that no one knows about, which is partly why I nearly hesitate to share and write a review. 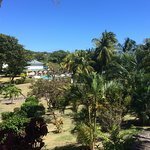 However, the undeniably above and beyond service I got to experience by Bequia Beach Hotel deserves a big shout out and for more good people to experience and visit Bequia. -Explore the island and all the views. -Jack’s Beach Bar, walk or take hotel shuttle over to the hotel beach bar on opposite side of island. -Take part in the morning yoga sessions that are held outside on a platform by the beach. I don’t do yoga on the regular, but really enjoyed it. -Island taxis are all charming pickup trucks that you hop in the back of. Makes this island even more fun and adventures. 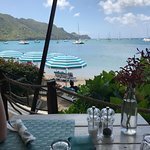 -WIFI is excellent, although I recommend turning off all distractions and exploring and getting to know new friends on Bequia. The hotel is mainly for older clients, there is not much for children to do. The beach is on the atlantic side so was too rough for swimming when we were there. However the pool was excellent with good bar service. There is a shuttle service to another beach on the Caribbean side which had good swimming, good loungers and a restaurant and bar. We booked a classic room but were unaware that it was up the hillside 81 steps (no lift). The brochure just shows it adjacent to a pool which most people might assume is at ground level. We declined the room in view of the steps and they found us a ground floor room instead. The main restaurant has a good variety of choice and good service with a nice ambience. Once a week they have a lobster night. The lobsters were excellent but only one chef with one barbecue was on duty for several hundred customers. This meant queuing for 20-30 minutes! All prices were in USD which is not very convenient for British clients. 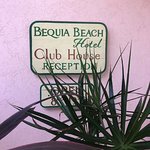 Room tip: Avoid Classic Rooms as you have to climb 81 steps to get there and back..
Bequia Beach Hotel has a rustic, colonial charm, with modern facilities, that is second to none of those we have experienced on our extensive travels. Everywhere is beautifully clean, there is excellent wi-fi coverage, the food is good and plentiful and the staff cannot be more cheerful, helpful, friendly and fun. Set on the Atlantic shoreline with the soothing, somnambulic constant of ocean breakers, in lovely grounds (Matthew’s Wednesday garden tour was very good), we found the hotel met, and in many areas, exceeded our expectations. We slept, snoozed, ate, drank, read, iPaded, swam, walked (repeated) ourselves into a relaxed stupor, occasionally achieving ‘standstill’ status, in the first few days and had a marvellous 10 day holiday. We went, and would recommend, all inclusive; the hotel is high end and its on site prices reflect that! 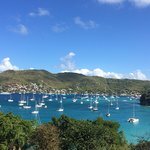 We walked around the island lots, but Bequia is hilly and many areas are not for the feint-hearted or infirm. The daily 1000 shuttle service to Jack’s Bar, on the Caribbean Sea, is a godsend and a good way to start with access to Princess Margaret Bay and a short walk to Port Elizabeth... the capital village (sic). 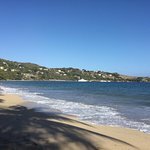 Bequia is quintessential Caribbean and the Bequia Beach Hotel a jewel within this Grenadinian crown. Room tip: Beach front rooms appear quieter than Classics. Just returned from our fourth stay (some folk on their seventh stay, people return time and again!) at our favourite holiday destination. It’s like we’re part of a family, staff and guests alike all pleased to be a part of paradise! This is an attractive and well-run hotel on an island we love. We spent a week here, a few years after the last visit, and would definitely go back again. The staff members are very charming and pleasant, and the owner is a hands-on man who takes interest in what the guests have to say. The guests seem, on average, to be older types like us. We got the standard of room we paid for. It was of an adequate size and well-furnished, although bathroom was quite small. The sea in Friendship Bay was once again quite lively during our stay, so there was no snorkelling there. We liked to walk over the hill to Lower Bay or Princess Margaret Beach. These superb beaches are often blissfully quiet. However, Bequia's Port Elizabeth is now on cruise ships' itineraries, so on some days they can be quite crowded. It's worth checking before you go. 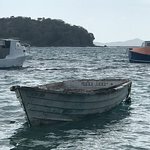 We went on the sailing ship Friendship Rose to Bequia for a day. The sea was pretty rough, but the day was much enjoyed by us. It's a nice hotel and a lovely island. Room tip: Beach front rooms are obviously the most desirable. Less expansive ones are tucked back and ours was up quite a lot of steps. Rest and more rest what more do you want? You could spend your whole holiday at the hotel - it has everything, good selection of rooms, two restaurants, bar, two pools, reading room, internet, watersports, nice garden and friendly staff who just want to help. Fresh food - Lobster and fish obviously, but fruit and herbs from the garden. However do explore the Island and accept that it is not like the bigger islands in the Caribbean. it is only 5 sq miles with 5,000 people. Oh and you can see the Island of Mustique from the beach.